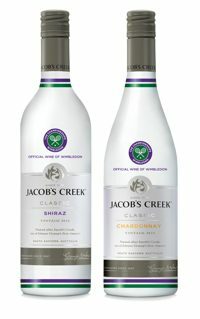 In celebration of its fourth year of partnership with the All England Lawn Tennis Club as the official wine of Wimbledon, the best-known Australian wine brand in the UK will be launching two tennis white inspired limited edition bottles of Jacob’s Creek Classic Chardonnay and Shiraz. The limited edition bottles will be available from June across multiple grocers with an RRP of £8.09. The brand, owned by Pernod Ricard, will also run a series of activations to help retailers and licensees maximise sales during the key trading period in the run up to, and during Wimbledon. To drive consumer awareness on the partnership, Jacob’s Creek will launch an on-pack neck collar promotion across 1.4 million bottles of Classics and Cool Harvest ranges, offering the opportunity to win five pairs of tickets to the Wimbledon Final and 500 iPad Mini 2s. Bespoke retailer activations will take place across multiple grocers, independent and cash & carry stores. A host of POS materials will include specially created in-store branded barkers, display units, tear strips and branded pallet wraps, offering consumers the chance to win Wimbledon tickets and hampers. A number of on-trade outlets will be supplied with Wimbledon-themed bunting, branded glasses, cocktail sticks, and bar runners in order to add an element of fun for consumers looking to enjoy the spirit of Wimbledon. In October 2010, Pernod Ricard signed an agreement with The All England Lawn Tennis Club (AELTC) under Jacobs Creek became the exclusive pouring wine at Wimbledon.